Making Wisconsin History with Sophia's Heart | Hupy and Abraham, S.C.
Wisconsin is rich in motorcycle history. It’s the birthplace of Harley-Davidson, the beginning of Buell and the home base of Royal Enfield North America. Racing roots run deep here too, Road America in Elkhart Lake is one of the fastest permanent road-racing tracks in the world, and Great Lakes Dragaway is the oldest operating drag strip in the country. 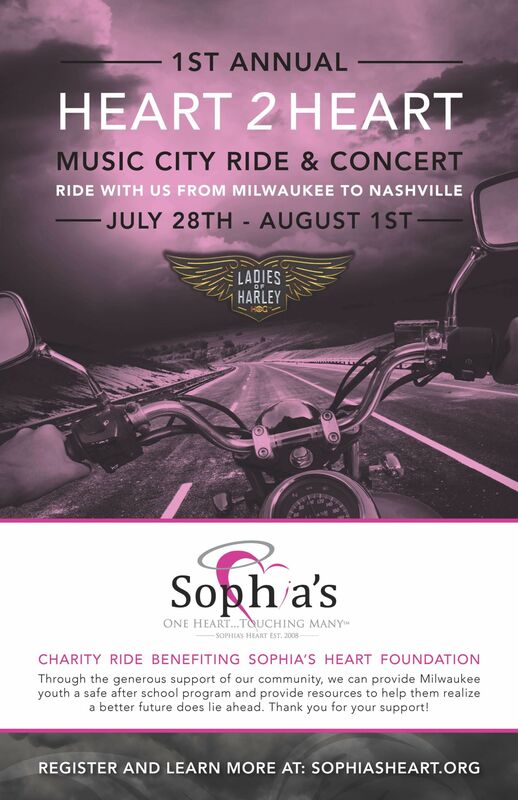 July 28-August 1, Milwaukee is the host of another piece of history, the First Heart 2 Heart Music City Ride & Concert by Sophia’s Heart Foundation. The Heart 2 Heart ride is a five-day event with the Ladies of Harley that stretches across the country. Starting in Milwaukee and ending in Nashville, highlights include a Music City Tour, prize drawings, a concert by Danny Gokey and a group dinner. All proceeds raised by the ride go to the development of a safe after-school program that benefits Milwaukee youth ages 11-17. Sophia’s Heart Foundation is a charitable organization that exists “to help mend and heal the hearts of children and families who have been touched by poverty, sickness, disease, broken families and broken dreams.” Through community work and donations, Sophia’s Heart seeks to use music and the arts to reach out to children and the needy in the community. Sophia’s Heart was founded in 2008 by American Idol alum and BMG recording artist Danny Gokey after the passing of his late wife, Sophia. The foundation today serves to memorialize not only her memory, but to continue the wide scope of her generosity and giving. To help spread motorcycle awareness in the community, order your free pink Watch For Motorcycles sticker by clicking here.